May 28, 2013 - PRLog -- Americast (http://www.ameri-casting.com) manufactures and distributes the best precast pads in the world and now Americast pads prepare to takeoff at: "The World's Greatest Aviation Celebration July 29, 2013. Honeywell Bendix/King, (http://www.bendixking.com)one of the leading avionics manufacturers in the world and Czarnowski Marketing--a top exhibit marketing partner (http://www.czarnowski.com) --have contracted with Americast for a 4,000 square foot Aircraft Slab. Americast can now produce precast pads/slabs that support as much as 6,800 lbs with the pads weighing 350 lbs. "Our Americast motto --'Anything related to precast stone that you can draw, we can make,' was echoed to me by Mr. Bronson and we have proudly met this challenge by providing a precast slab to support the aircraft showcase by Bendix/King; and at 1/2 the cost of typical slab construction --pouring in place. Exhibitors can spend thousands of dollars on concrete poured in place to support their exhibit. With the Americast precast pads, you can save thousands and put those savings into displaying your product. We love working with people like Chris Bronson and his marketing team -Czarnowsk (https://www.google.com/search?q=czarnowski+marketing&...)i--; they are really creative folks and open to new and more efficient ways of doing things. We look forward with the greatest of enthusiasm to more projects with the wonderful team of Bendix/King Honeywell and Czarnowksi. There is nothing more exciting than being paid to be creative. We love what we do." Americast will complete the 4,000 square foot slab at a cost of 52% less than the General Contractor quote for pouring in place. Delivery to Oskosh, WI by July 15th for "The The World's Greatest Aviation Celebration (http://www.google.com/url?sa=t&rct=j&q=&esrc=...) EAA AirVenture Oshkosh 2013 - (http://www.google.com/url?sa=t&rct=j&q=&esrc=s&source=web&cd=8&ved=0CFIQFjAH&url=http%3A%2F%2Fwww.eaa.org%2Fcalendar%2Feventdetail.aspx%3Fid%3D7014&ei=Hl2iUeGFHIvO9ASuhoDABg&usg=AFQjCNHoGyUdtUWwnHYce-sEdALIr-CXvA&sig2=c0IrAC-_s5sJ8cbA73nQYg&bvm=bv.47008514,d.eWU&cad=rja) Monday - Sunday, July 29, 2013 - August 4, 2013. EAA AirVenture Oshkosh 2013 . For seven days, the aviation world descends on Oshkosh to create the World's Greatest Aviation Celebration. Nearly every aspect of flight is represented in one way or another -- from ultralights to the heavy iron of the Warbirds, AirVenture has it all. Exhibitors showing off the latest aviation innovations, informative forums presented by industry leaders and hands-on workshops compliment the variety of AirVenture activities. 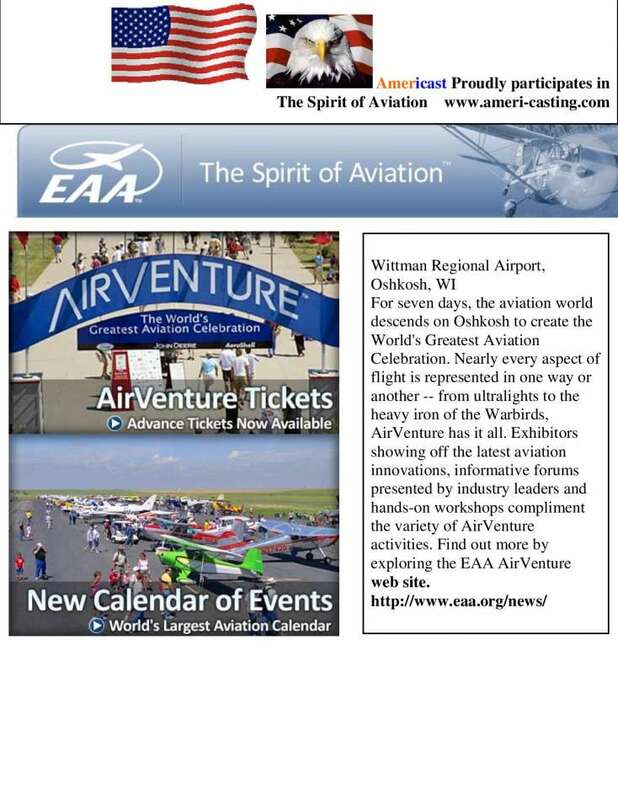 Find out more by exploring the EAA AirVenture web site.